As well as having its own resident Pied Wagtails, southern Britain provides winter homes to many Pied Wagtails from the north of Scotland. The tail-wagging antics of these striking birds make them fairly easy to recognise, even at a distance. These are birds of open farmland, only occasionally visiting gardens; however, they do seem to find car parks in towns and villages particularly attractive. The male and female are quite similar, but the female has a greyer back and in summer the male has a much larger black bib. In winter, the male is dark grey and both male and female have just a crescent-shaped black bib. Insects are the staple diet of these pretty birds, and hence they spend quite a lot of time near water. 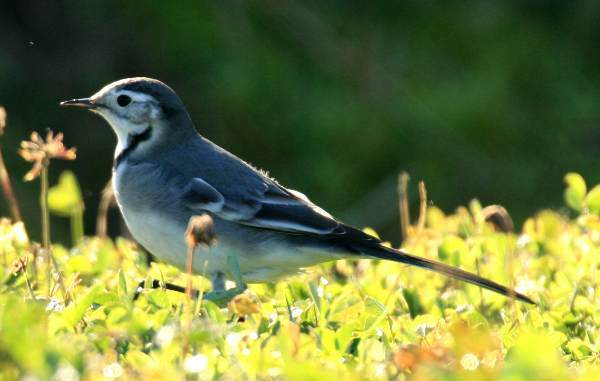 Pied wagtails build their nests in holes in banks or walls, often near to water. They use dried grass, hair and wool as nesting material. Four to six eggs is normal.